B.C. Premier John Horgan said earlier Tuesday that destructive wildfires annually "may be the new normal." Prime Minister Justin Trudeau will meet with first responders and British Columbians displaced by the wildfires scorching the province on Thursday. Trudeau made the announcement during a photo op with B.C. Premier John Horgan in Nanaimo late Tuesday afternoon, ahead of a retreat with his newly shuffled cabinet. "Our thoughts are with the first responders, the firefighters and the residents who are struggling through the wildfires that are raging across the province," Trudeau said. "Obviously this is something that is very much a topic of conversation that we'll be engaged in." Horgan said government leaders at all levels were working together on the crisis, which has the province under a state of emergency for the second consecutive summer — a situation he called "unprecedented." Horgan expressed dismay as he toured the wildfire-stricken area around Prince George on Tuesday morning. "We're concerned — all of us — that this may be the new normal," Horgan told reporters, standing alongside federal Defence Minister Harjit Sajjan. Emergency officials are worried about wind and lightning forecast for the region, with no rain for the foreseeable future, Horgan said. There are 565 fires currently burning across the province. More than 20,000 people are on evacuation alert or under evacuation order. The Canadian Armed Forces have deployed about 300 personnel to help fight the fires in B.C., Sajjan said. "We're coming together far too often like this." Referring to an independent review of last year's devastating wildfires and floods in B.C., Horgan said the province was halfway through the recommendations when it had to put the report down to focus on this year's fires. "From flood to fire to flood and then again to fire," he said. "And we have had two states of emergency. That's unprecedented." "That speaks to the changing environment we live in and the ravages of climate change." When asked how the province can justify supporting a proposed LNG energy project and simultaneously try to curb greenhouse gas emissions, Horgan said B.C. is just 4.5 million people sharing a planet with seven billion others. "We have to be realistic about what our impacts would be," he said. On Monday night, fire officials painted an alarming picture of three huge, raging wildfires racing through an area of central B.C., west of Prince George — one group among hundreds of blazes spreading smoke and flames across the province. 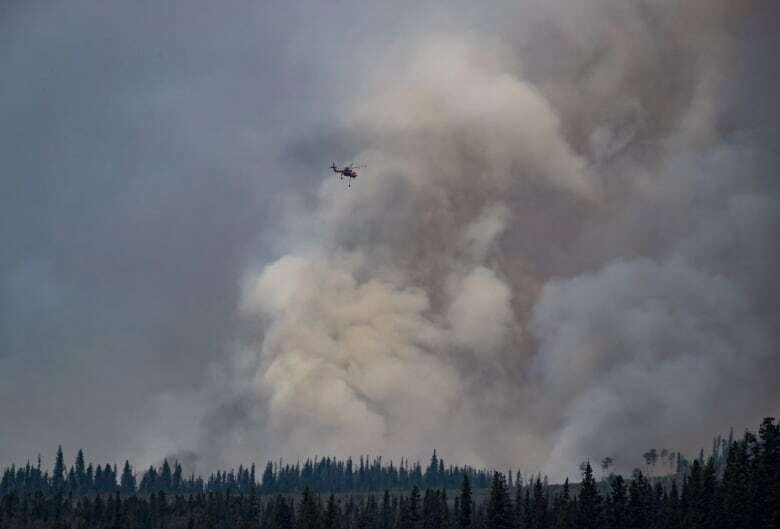 The officials were at the Grassy Plains School, just south of Burns Lake on the south side of François Lake, to speak with people who are defying evacuation orders for the Nadina-Verdun wildfire complex. 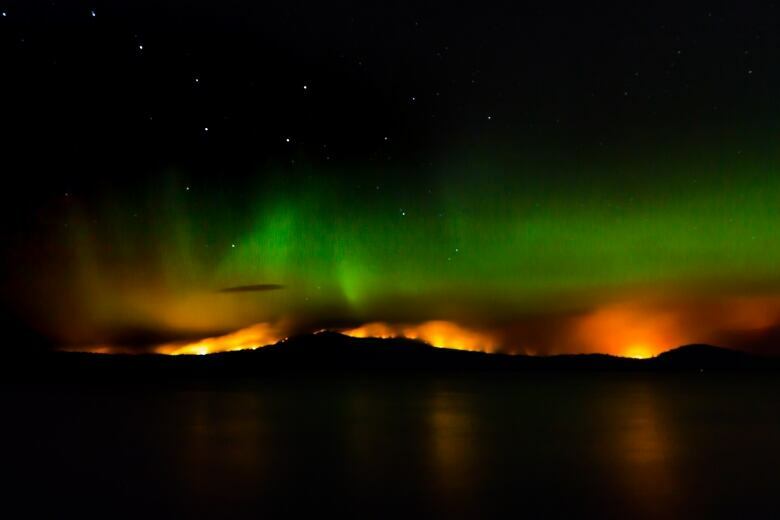 The Nadina Lake, Verdun Mountain and Island Lake fires combined currently cover more than 1,000 square kilometres. "It's dire here right now," incident commander Pete Lang told a group of residents, many of whom were angry with the province's response to the fires in the region. Lang said he hoped the meeting would help dispel rumours and misinformation being spread on social media and help residents make an informed decision about what to do. Residents in the small community, located about 230 kilometres west of Prince George, mostly rely on ferry service to get in and out. Fire behaviour specialist Dana Hicks made it clear at the meeting that the area around Burns Lake is so dry and the fires so hot, that there isn't much firefighters can do to quell the flames. "These fires will be free burning tomorrow," Hicks said. "Nothing will be able to save us tomorrow. The fires are going to move." Trees killed by the mountain pine beetles that have infested the region for years are drier than plywood, Hicks said. "The intensity that's putting off; we can't put firefighters near it, water's no good," he said. 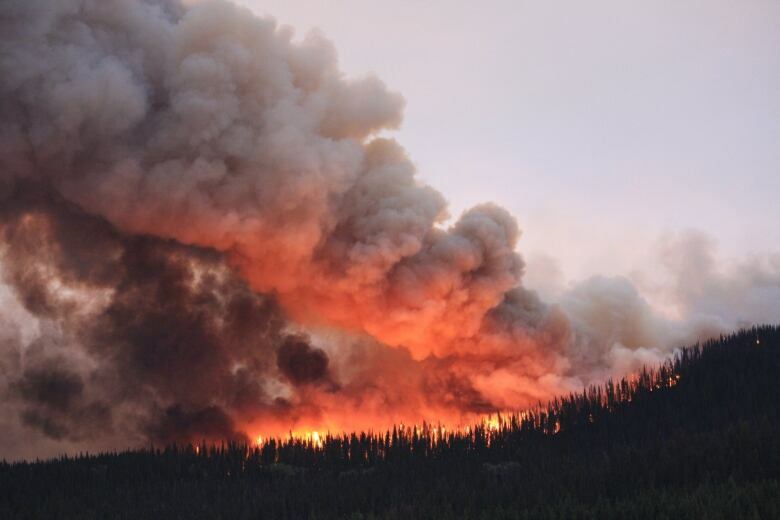 Both the Nadina Lake and Verdun Mountain fires have moved about five to seven kilometres a day, Hicks said. Hicks told those who decide to stay to keep in place and resist the urge to take off. He said those who die in wildfires most often do so when they're fleeing. "Be safe and make the right decisions," he said. Residents at the meeting questioned how the fires had gotten to this stage and accused the wildfire service of assigning too few resources. Rise Johansen, who runs the Takysie Lake Lodge, said adrenaline is running high throughout the community and many residents in the small northern community have little trust in authority. Those resisting evacuation are keen to protect their properties and cattle, she said. "My sense in the room last night was sheer fear, which is coming out as anger, because everybody is scared," Johansen said. In the Cariboo region, smoke is beginning to clear even as haze still blankets other parts of the province. The Cariboo Regional District says there has been a "dramatic" improvement in air quality over a 24-hour period, although 61 fires are still burning in the area and the fire danger rating remains extreme or high. Poor conditions could still return later in the week, but district officials say it's too early to tell so they are not lifting any evacuation alerts. The region has five evacuation orders in place covering more than 14,000 square kilometres and affecting more than 100 residents.